Koi, or more specifically nishikigoi, is a variety of carp that are kept because of their beautiful colors and designs, that’s why they’re great for tattoos – Koi fish tattoos. Koi fish are usually seen in outdoor ponds, water gardens, and open-air aquariums. The Koi varieties can be very expensive, depending on their combination of colors and design patterns. In Japan, Koi convey a message of love and friendship. In China, they are also popular and always associated with good fortune. Legend has it that a Koi was able to swim up a waterfall and then turned into a dragon. In China, seven golden koi meant good luck. Originally domesticated in East Asia, the fascination with these beautiful fish spread to western countries. Later on, people started to make use of them as tattoo designs. These beautiful fish come in a variety of colors and each of these have their unique symbolism. Silver or platinum koi fish have become symbols of wealth and success in business. Gold fish meant prosperity and a belief that they bring luck in lottery. Red and white koi represented career luck. 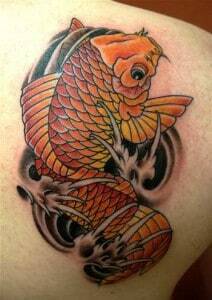 Colorful koi fish symbolized family and friendship. The different colors are also used to stand for the members of the family. The black koi represents the father, red and orange for the mother, pink koi for the daughter, and blue and white colors for the son. Koi tattoos also signify the ability to attain goals and overcome life’s difficulties. This may be because these fish are known to be hardy, easily adapt to their environment, and have the ability to survive various conditions. A koi swimming upstream against the current has been used as a symbol of determination. Lastly, koi are referred to as living jewels. This made them very popular in paintings and utilized in various forms of art. There is a mystique that continues to be associated with them. No wonder why the koi fish tattoos are admired and well-liked.